Face painting workshop now available for your next Library or Camp event! Would you like to learn how to face paint? Margi is a world renowned face and body art teacher and author of 4 best selling face painting instructional books! A great rainy day event! Cartoon creations-Join Margi as she guides students through the step by step process of simple cartoon face painting and the magic of animation. In this hands on instructional workshop the students will use Margi’s “Creative in a Crunch” step by step instructional workbook to help them to understand the techniques and tools used to create her lively designs. Together they will paint an animated cartoon and wear it home to share with their friends and family. 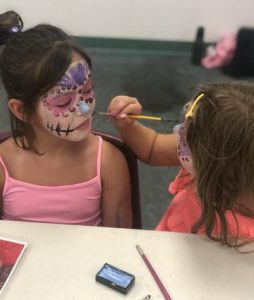 Sugar Skull Workshop-Learn how to create fast and fun sugar skulls with world renown face painting instructor Margi Kanter! Join Margi as she shares the history of the Day of the Dead as she guides students through the quick easy steps to creating there own colorful sugar skull! Step by step instructions are left with each student as a visual reminder for them to use with their newly acquired skills.